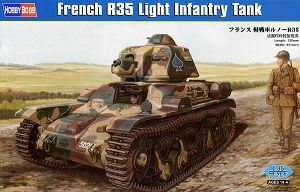 The kit represents and earlier production R35 as it has the larger vision ports on the turret and not the later smaller slit vision ports but the kit is extensively detailed with full engine/transmission/radiator as well as the driver’s station but conspicuous by its absence is the large ammo racks for the 37mm gun which should be inside the hull. 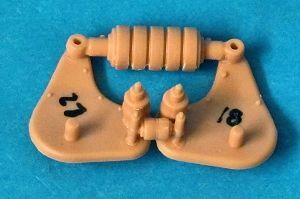 You also get a choice of idler wheels, one with six lightening holes and the other with the holes blanked off giving a solid wheel dish and all the hatches are separate parts with inner side detail if you wish to show these open? 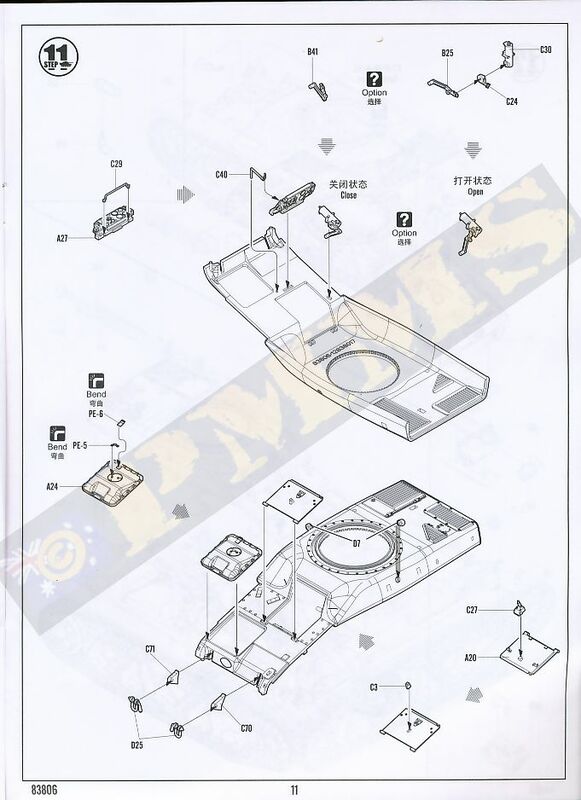 1 16 page instruction booklet Etched parts and Metal barrel tube. As seems to be the case these days there are some instruction bloopers with a couple of miss-numbered parts and a few that are not numbered in the instructions at all and if you follow the instructions you won’t be able to fit the hull top/glacis in place as well as some other smaller assembly issues and I will hopefully show ways around these, some require parts trimming and others using a different assembly sequence but again more as we proceed. If you are building the kit closed up you can dispense with assembling the interior which will save considerable time as there are as many (or more) parts for the interior than the rest of the model and as you can’t see any of the radiator/fuel tank or the engine itself after assembly you could leave these even if having the front hatches open, that is up to the individual as there is always the “we know it’s there” theory. 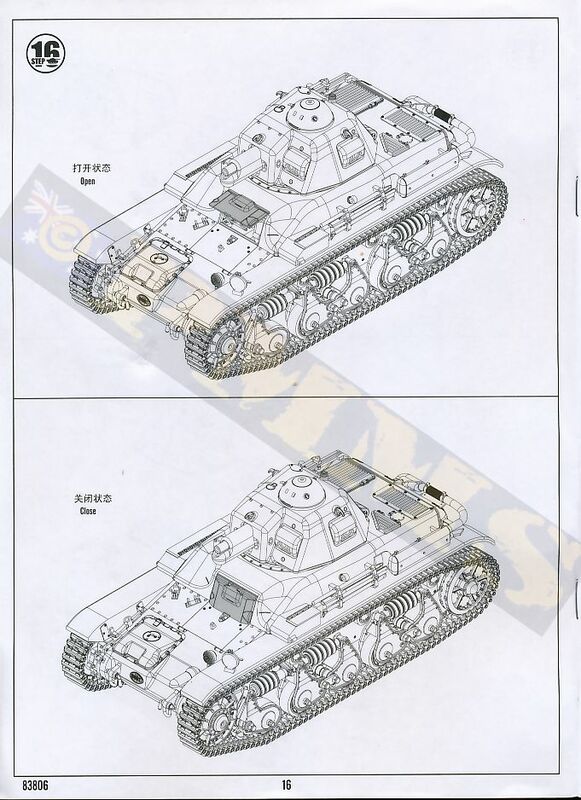 Dimensionally the kit measures out quite well against the 1:35 plans in the Tank Power book but as this is the only one set of plans it’s best to have a second set to verify as there are some notable errors in the plans, so I will just mention some measurements and leave it to the individual to take or leave? 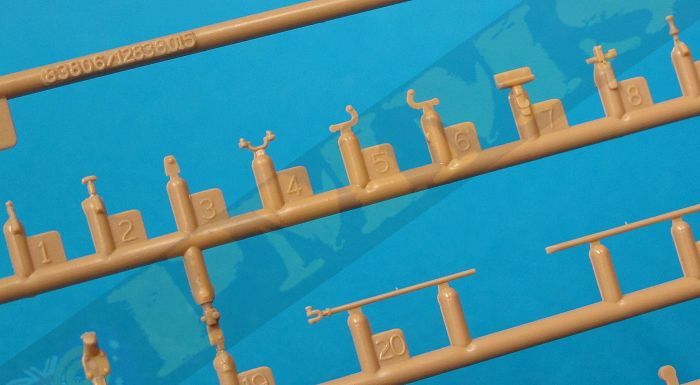 Note most measurements have been rounded to .05mm as getting any smaller is really irrelevant in scale. 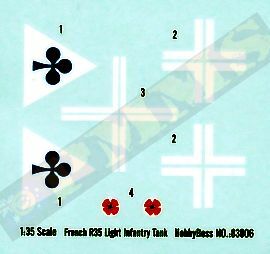 The upper hull matches in width and length although the front glacis is 1.5mm narrower than the plans indicate and has fit issues which we will look at this closer later. 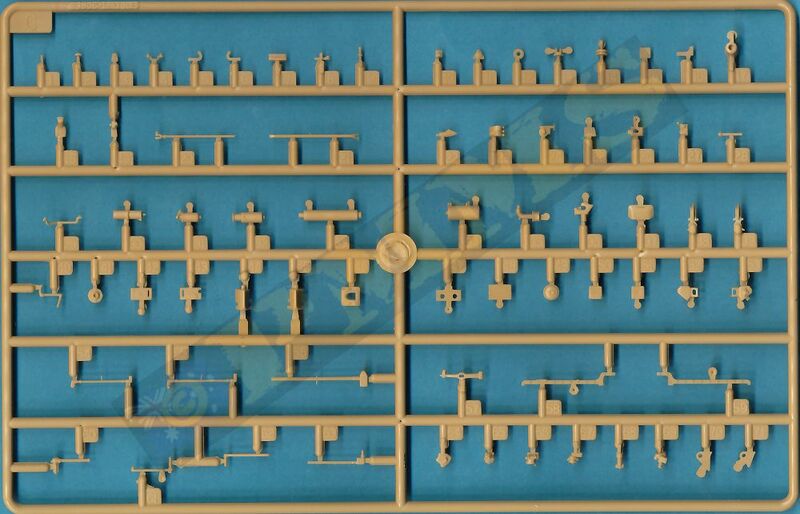 The two driver’s hatches are 1.5mm wider than the plans indicate but on referring to period and museum photos the kit hatches are actually correct and the plans too narrow, just another example of not betting your house on a single set of plans. The transmission hatch is also good for size. The lower hull length is good but the width shows in most measurements to be about 1mm too narrow which isn’t much to worry about given the plans can’t be totally relied upon. With the suspension the 1:35 plans are not much help as they have some parts drawn the wrong size, the book thankfully gives a plan view of the suspension from the Russian manual with the actual suspension dimensions given so we can determine the correct sizes in 1:35 and I’ll take the measurements directly for there. This isn’t the first time we see a book give the actual dimensions and the plans in the same book having different dimensions which can lead to confusion and incorrect assumptions at times. 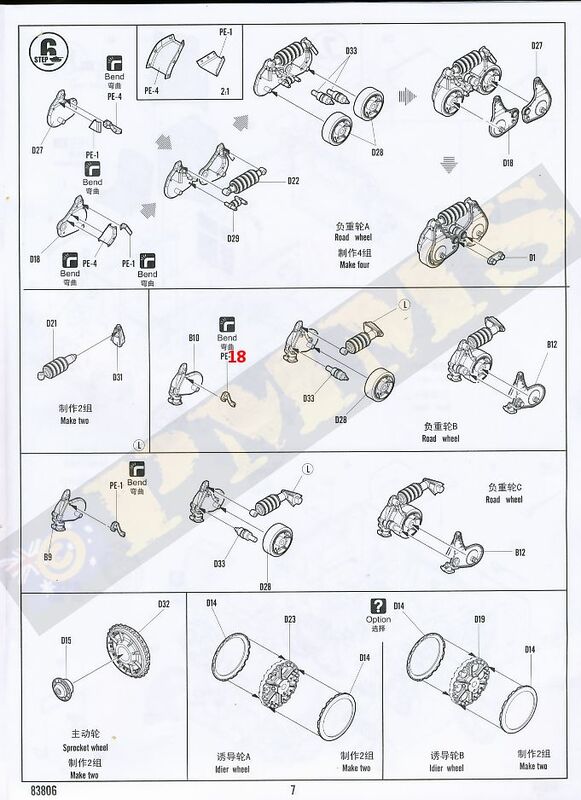 Idler wheels are 590mm in diameter, 16.85mm in 1:35 with the kit idlers being 16.95mm. 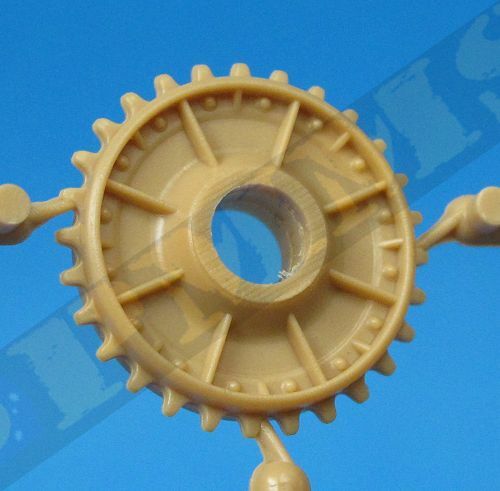 Drive sprockets are 640mm diameter (to the outside of the teeth), 18.5mm in 1:35 with the kit drive sprockets being 19.5mm. 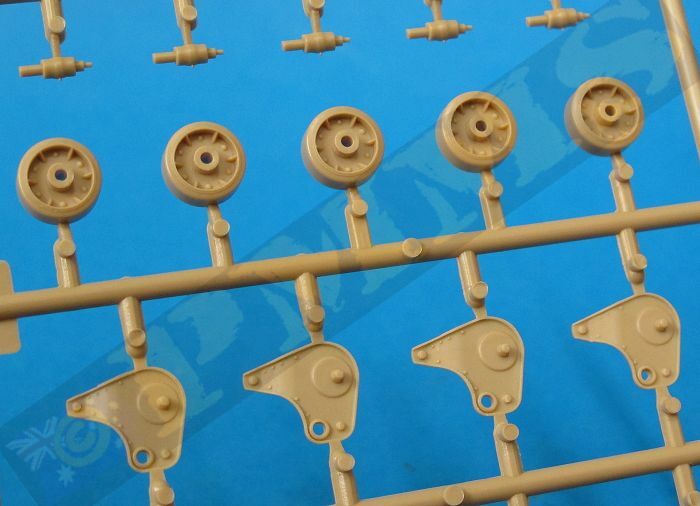 Road wheels are 385mm in diameter, 11.0mm in 1:35 with the kit wheels at 10.5mm. 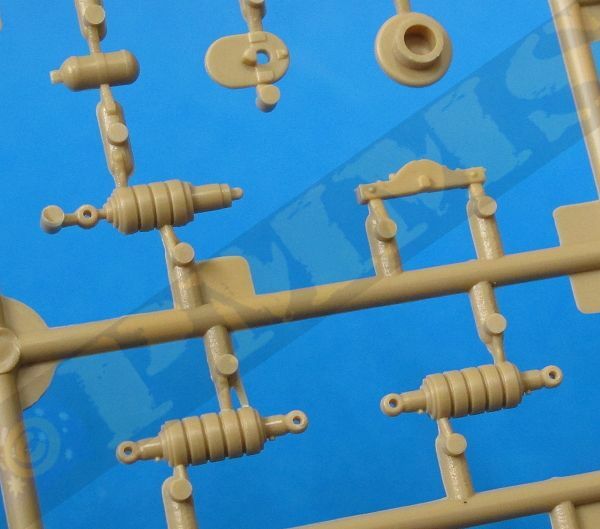 Return rollers are 185mm in diameter, 5.3mm in 1:35 with the kit return rollers being 5.3mm. 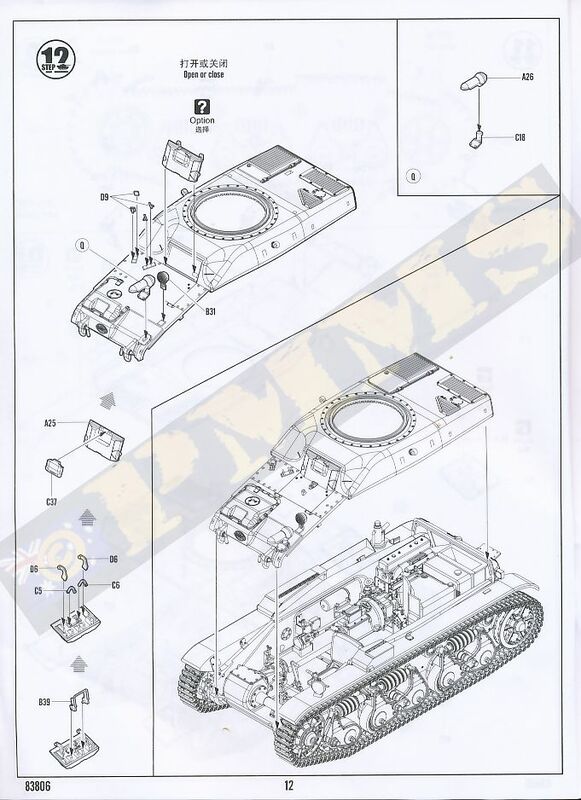 Other turret details look good in relation to the turret outline although the barrel cradle extends about 1mm further out than the plans indicate and again you can take or leave this as you see fit. 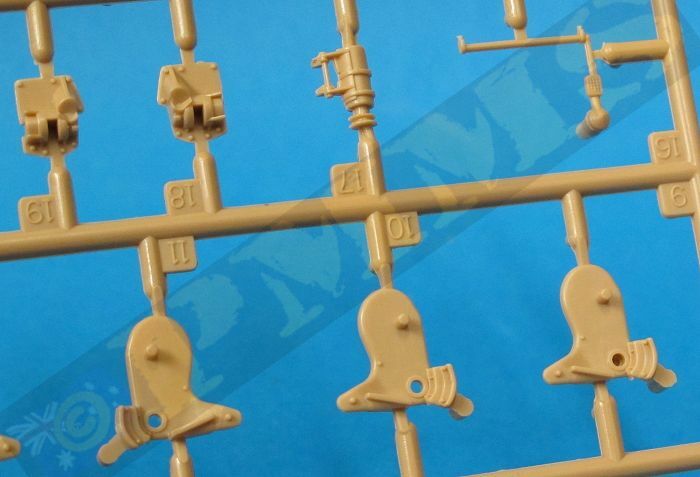 So most only have minor discrepancies and are not really worth getting too excited about but unfortunately it’s not the dimensions that are the issue but the assembly as the suspension is the most troublesome area of the entire kit as we will see below. The lower hull has the floor and two sides separate with the rear hull panel another separate part with the sides having detail on both sides, there are few issues here, firstly the locating holes for the inside detail parts go all the way through the walls meaning you need to fill these on the outside after the parts have been fitted with 5 holes on the right side and 1 on the left side needing filling. The other issue comes when you go to fit the hull top that includes the glacis as there is inner detail for the final drives that projects out from the side walls with small fillets on the glacis meant to fit under these projections, but this isn’t going to happen as the two locating pins on the front of the glacis prevent the glacis from slipping under the projections and cutting off the locating pins isn’t a simple remedy unfortunately as the transmission also prevents this so we need to alter the method of assembly here, see more on this below. But before we tackle that issue there is the extensive interior to assembly, this includes the full engine and transmission, the large radiator and fan assembly, the fuel tank and the front office with driver’s seat, foot pedals and steering levers as well as the floor linkages and it’s best to assembly and fit these before fitting the side hull panels to give plenty of working room. 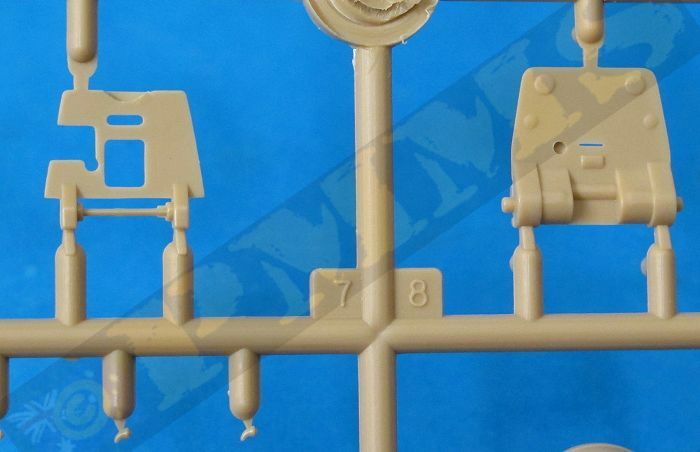 There are some items conspicuous by their absence such as the large ammo racks for the 37mm gun which should be in the lower hull but as you can’t see this or any of the engine, fuel tank or radiator assembly after the hull is assembled it’s probably a bit of a moot point. The only interior you can see is the driver’s seat and gear shift lever on the transmission if you have the two largish driver’s hatches open, the transmission can also be seen if it’s cover hatch is left off but this would only be removed for workshop servicing of the transmission and is usually left closed. With the engine assembly many of the smaller parts needed the locating holes opened up for the parts to fit properly and as there are quite a few smaller parts care is needed especially since four of these small parts aren’t numbered in the instructions and I have added these to the instruction images included at the links below. 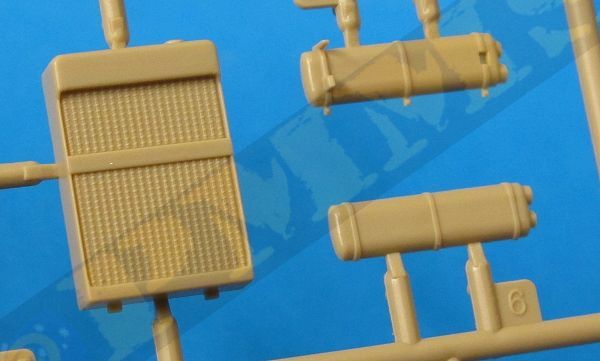 On the oil cooler there is a perforated etched plate that needs to be bent but there is no indication of the actual shape so a bit of trial and error is the only option, but again you can’t see this after assembly so don’t bother unless you specifically want it there. The transmission and front differential also have multiple parts that need care in fitting especially getting the long transmission parts aligned correctly and when fitting the engine/transmission to the floor I had to cut about 2mm from the exhaust pipe to fit inside the rear hull. 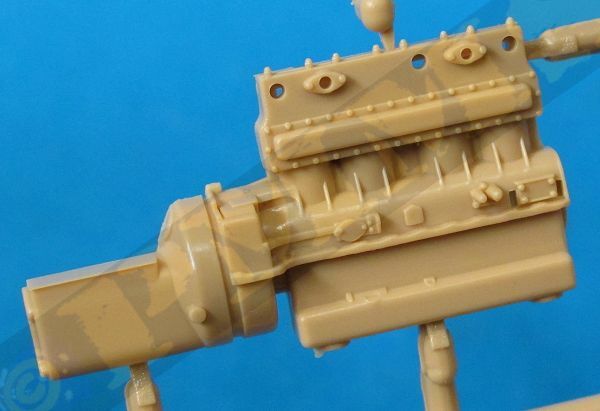 There are no locating marks to fit the engine assembly but the oil cooler pipe sits inside the cut-out in the compartment bulkhead (part A8) as well as locating pins for the front differential. 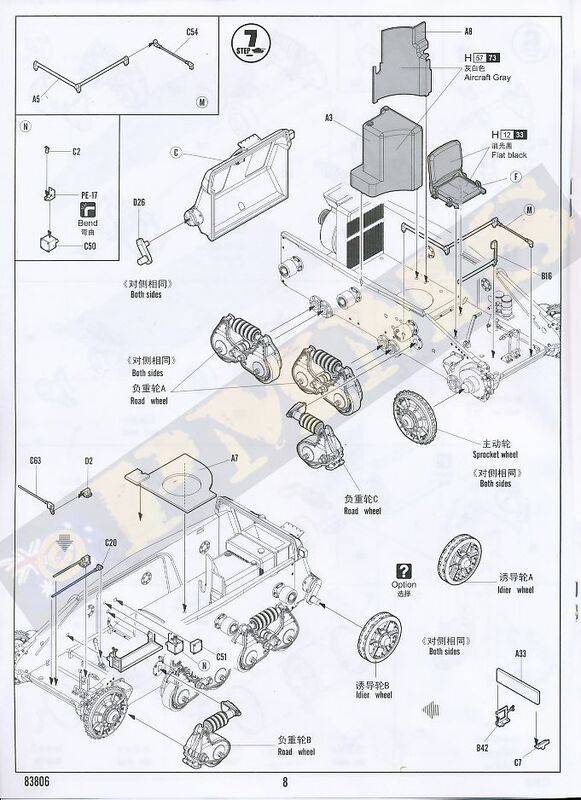 You must ensure the differential is fitted perfectly as there is some movement possible with the pins and if not set perfectly square inside the hull the long drive shaft (part C33) will not mate with the hole in the side wall correctly. 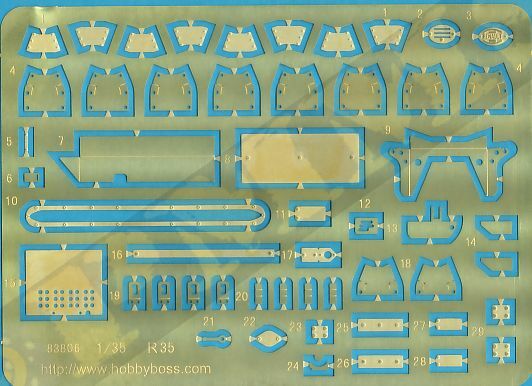 Note, the first item to be fitted to the hull floor is the central cross channel (part B26 and associated etched bolt strip (part PE-10) and the ends of the etched part can easily be bent to the curve once the channel and etched part are glued in place on the floor. 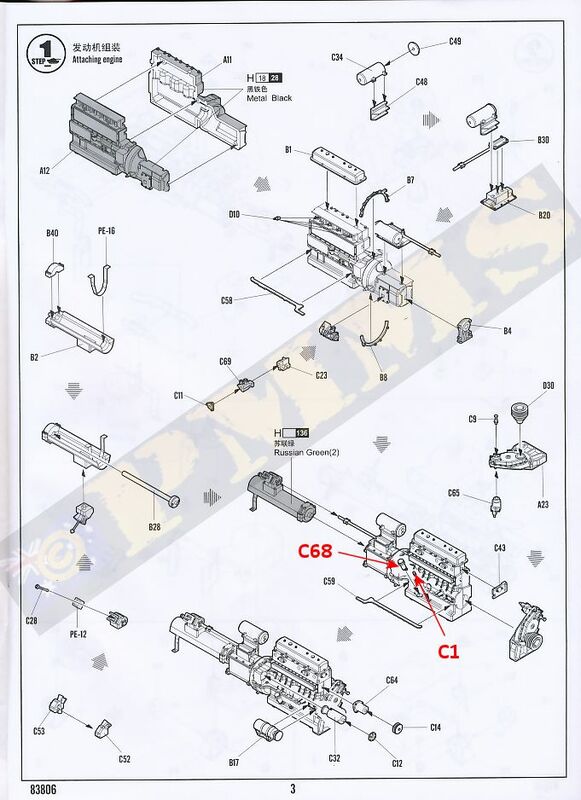 Other interior parts go over this channel notably the transmission and false floor (part A7) so it’s important to fit the channel first to avoid problems later. Assembly of the seats has etched parts for the base but I had to trim the seat cushion to fit inside the etched base as well as trim the tabs on the backrest to fit better as well. The four etched side mounting brackets (parts PE-19) are best left off until the seat is glued to the floor to get the best fit. 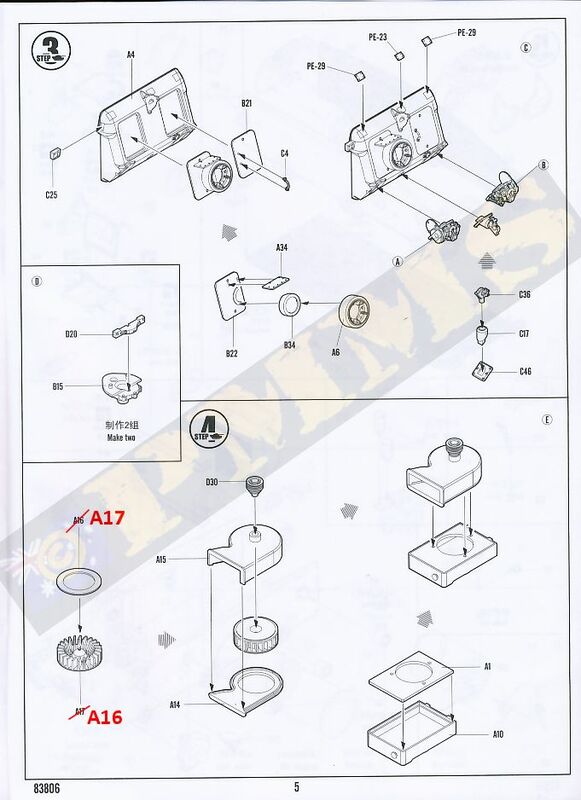 Fitting the gear levers and floor linkages is fairly straightforward although care is needed with the small parts for the various linkage sub-assemblies. With the interior completed the two hull side panels can be added and these fitted without any problems, I also fitted the rear hull panel (part A4) to ensure the side panels were perfectly upright and it was easier to fit the rear hull panel before adding the additional details as shown in Step 3 so they don’t get in the way when fitting the rear hull. The two rear engine compartment doors simply don’t fit properly and will need to trim the inside hull opening lip quite a bit to allow the doors to fit, but even then they sit a little proud of the rear panel when they should sit flush with the rear panel and some extra work is needed to get these to sit flush as they should. On the upper edge of the rear panel are engraved locating marks for three small square etched plates (parts PE-23, PE-29) but these brackets are left over from the previous 4.7cm 731(f) (kit #83807) as they are the mounting brackets for the rear superstructure supports on that kit and you need to fill these locating marks and not use the etched parts of course. The multipart idler mountings go together well to give a nicely detailed assembly with a positive location for the idler axle mounting that ensures are in the correct position, the fit of the idler assembly is also very positive for a robust assembly. The central towing pintle mount also assembles easily as does the spare road wheel on the left access door. 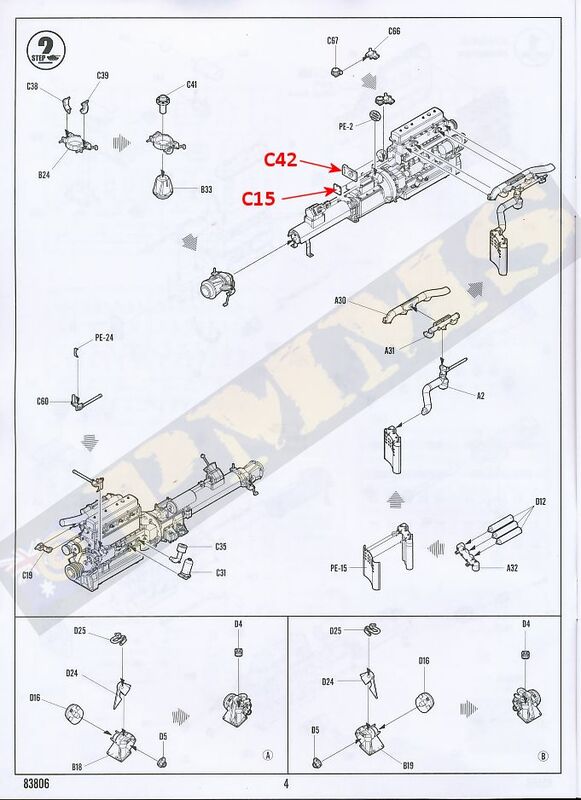 The suspension on the R35 looks fairly simple with two double and one single wheel bogie units per side but the actual assembly is anything but easy with each bogie unit having two etched inner brackets. 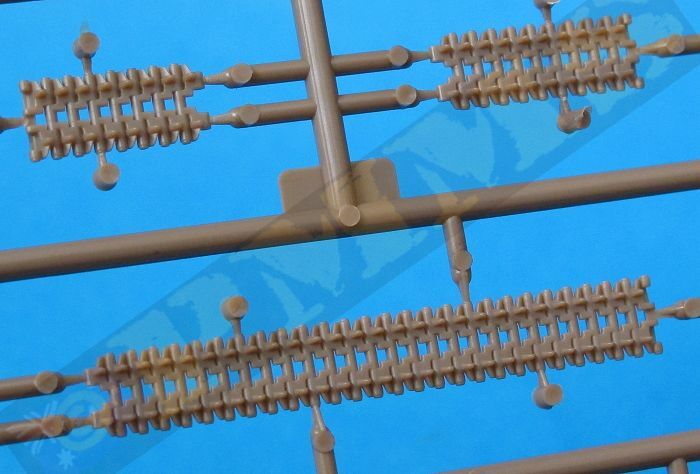 The larger brackets (parts PE-4) have to be bent into a curve while the edges bent at right angles and there are no bend lines only partial lines in the middle as well as no indication as to the exact amount of curve you need to make and using the plastic bogie faces as a guide is the only option really. Considering that’s a total of 18 etched brackets that have to have the curve bent exactly the same as well as the widths exactly the same to fit between the inner and outer bogie faces gives you an indication this task is anything but simple, but let’s press on. 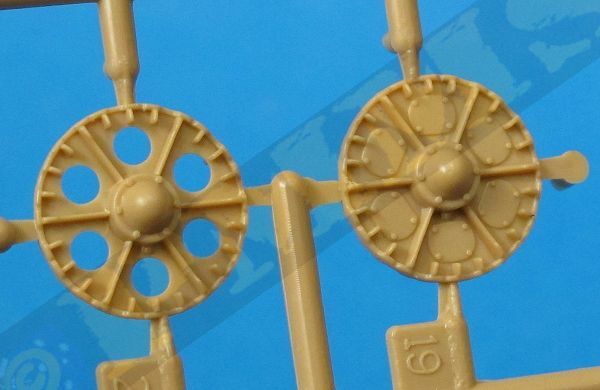 Also note on the single wheel bogie the etched bracket should be PE-18 and not PE-1 as indicated in the instructions. 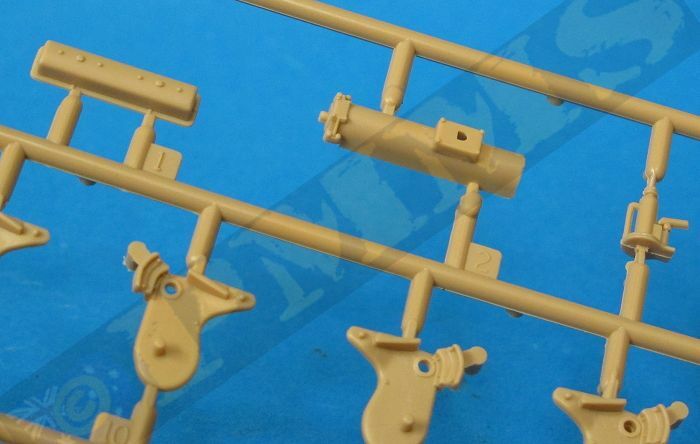 Getting the smaller brackets (parts PE-1) bent equally on both sides and the same width is based on pure guesswork due to no bending lines and is quite difficult. 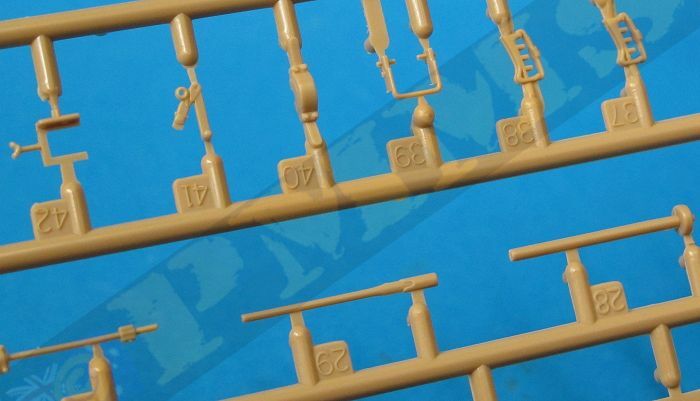 Even after bending and re-bending you still don’t know if correct until you go to fit the bogies together. In the end these etched parts make for a lot of extra work for no detail gain over plastic given you can only see the outside face of the brackets after assembly so the thickness of the parts is irrelevant and I finally gave up trying to get these things bent correctly (the widths being the main issue) and have replaced the etched brackets with some made from thin plastic card, I also altered the assembly sequence of the bogies to try and improve the situation. I firstly glued together all the bogie parts for the inner bogies faces except for the wheels and let the glue dry completely, this gave a firm footing to work getting the spacer brackets fitted and using the etched parts for a basic size guide I made one set of brackets from thin plastic card, test fitting and trimming often till the shape and fit was right. I then used this as a template to shape the remaining brackets with the bend in the larger bracket easily done with the thin card and using the small PE locating pins inside the bogie halves to ‘sit’ the plastic bracket on ensuring it was positioned correctly. 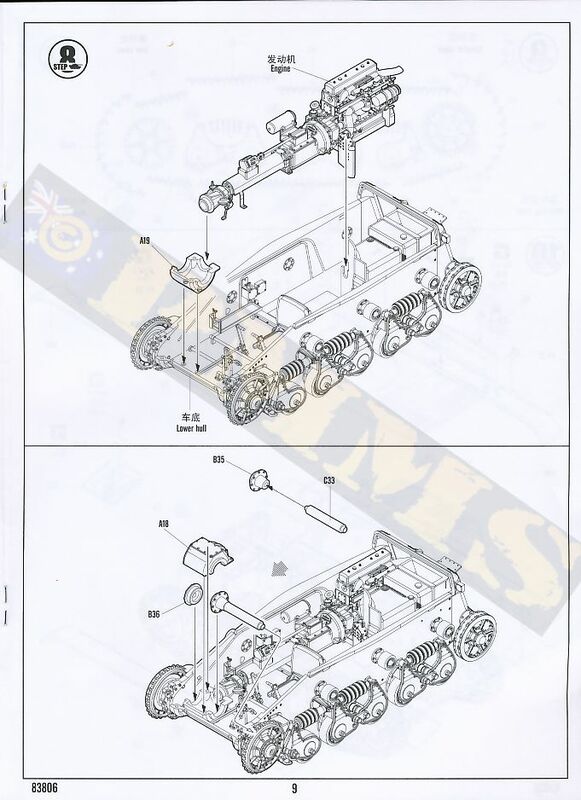 Note the single wheel bogie has a different sized and shaped bracket so this will have to be made separately while the smaller brackets on the two wheel bogie was fairly simply to make having straight sides and with these made the remainder of the bogies can be assembled. 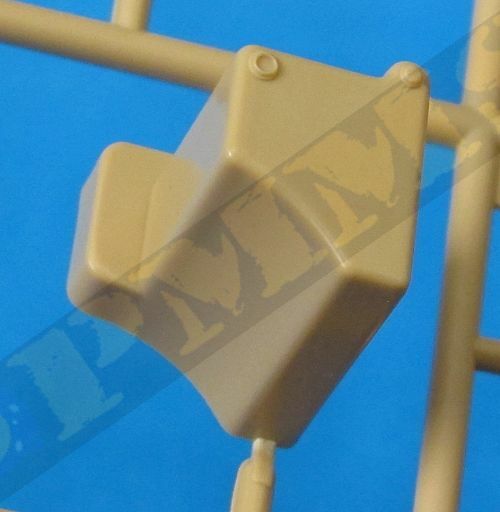 to replace the troublesome etched brackets supplied in the kit. The etched brackets, very difficult indeed to get these all bent the same shape and widths. 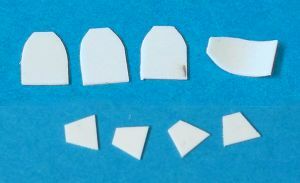 The replacement plastic card brackets cut to shape. 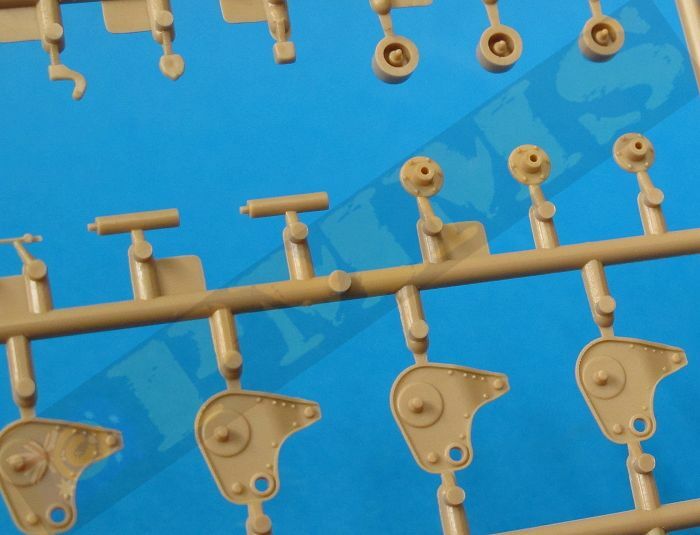 The plastic card brackets added to the inner bogie halves. 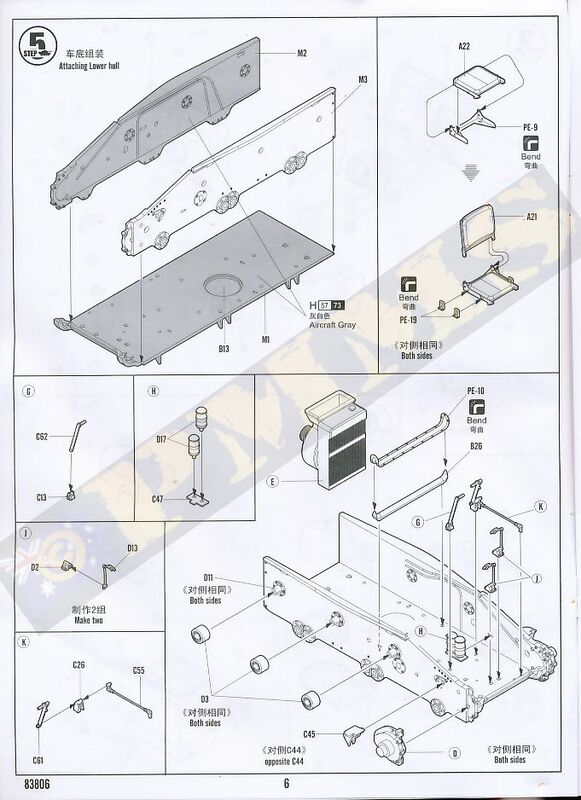 Another issue is the numerous separate bogie parts allow for quite a bit of movement during assembly and you must ensure everything is aligned perfectly to allow both wheels to sit level on the floor as well as the other parts, notably the front attachment (parts D1) to also sit level. Due to the work needed in remaking the brackets some of the alignment on the bogies was not as it should be when it came to fitting the bogies to the hull in my build, also the fit of the two bogie pins to the hull locating holes was quite loose and you must ensure the bogies sit level at ground contact as well as vertical to the hull sides as the glue dries otherwise things can easily get out of shape. 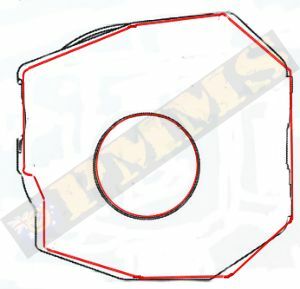 Another issue was the single wheel of the front bogie unit didn’t sit on the floor level with the other four wheels and some manipulation of the bogie will be needed here. 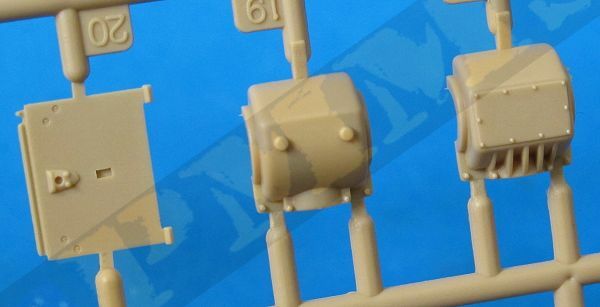 The large shock absorber on the single front bogie has a D shaped locating hole on the hull side but the pin on the shock absorber is round so you will need to make the D hole into round hole to fit properly. The two final drive housings have a separate inner bracket and the mating surfaces of these need to be smoothed out to ensure a proper fit to the main final drive, the same applies when fitting to the hull and some minor trimming may be needed to get a snug fit. 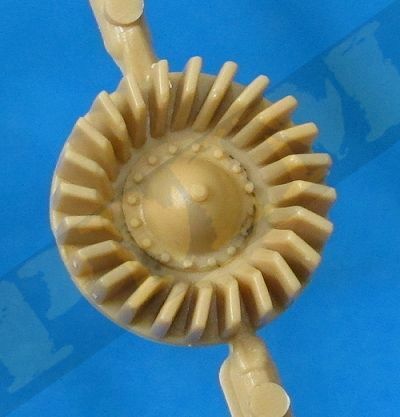 The drive sprockets are a single part with separate central hub cap and this is designed to simply glue to the final drive axle but you should leave this unglued until after the track is fitted as some movement of the sprocket is needed to get the tracks to fit correctly. Another issue is there is a sprocket cleaning bracket (parts C44, C45) fitted to the hull side with the sprocket teeth fitting inside a notch on the bracket and if you glue the brackets in place as indicated in Step 5 it is very difficult to fit the drive sprockets later in Step 7 as you will need to force the sprockets over the axle stubs while fitting the teeth into the bracket slot and fitting the brackets and the sprocket at the same time will make life a lot easier here. 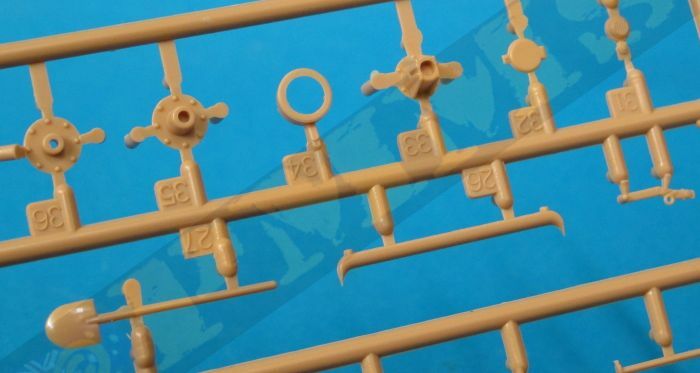 The one piece return rollers have separate mountings that attach to the hull side and these are the wrong shape, they should be cone shaped not tubular as in the kit but as this is very difficult to see after assembly may not be an issue. 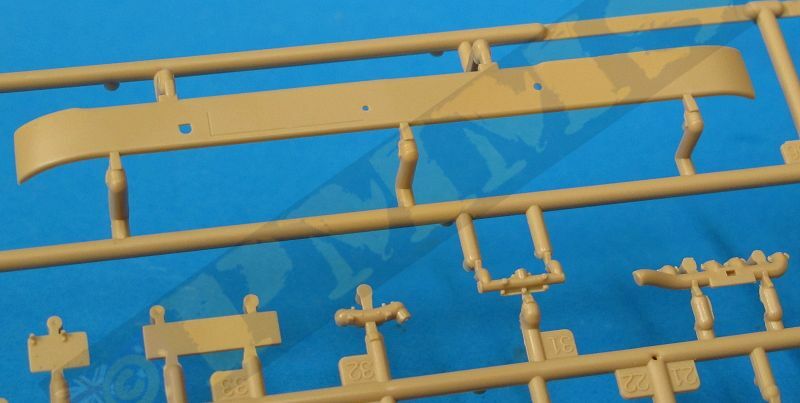 But when you come to fit the track in Step 9 you find the return rollers are located about 2.5mm too close to the hull side and the track simply will not fit over them. I had to remove the rollers fitted in Step 5 and make new axle stubs from rod and reposition these 2.5mm further out so the rollers lined up with the road wheels, sprockets and idler allowing the track to be fitted properly. 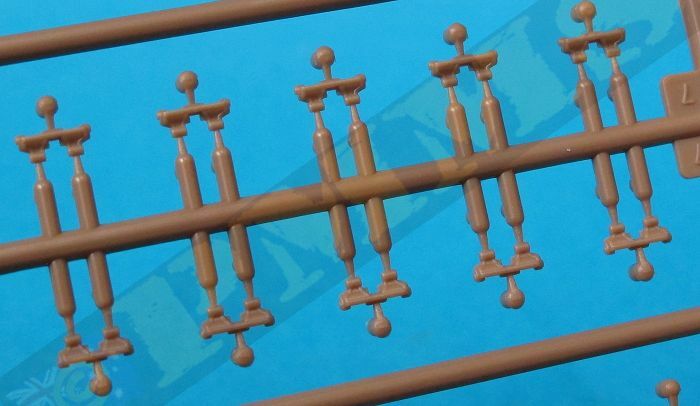 It could be an idea to leave off the return rollers from Step 5 until the bogies have been attached to the hull (Step 7) so you can then fit the rollers the correct distance out from the hull, but you will need to make new axle stubs in any case and this just adds to the work needed to get the suspension done on this kit. The idler wheels as mentioned give you alternate wheels with open or blanked over holes and also have separate outer rim sections that do give very good detail definition around the outer lip of the idlers. 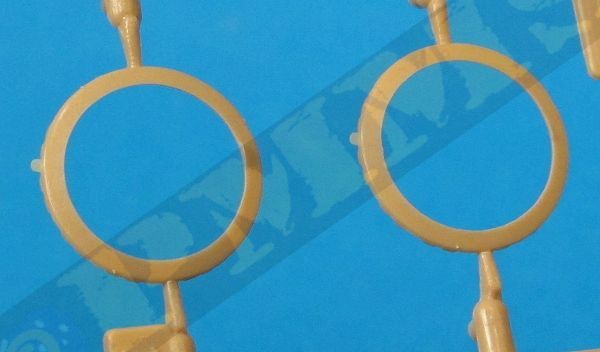 Care is needed when fitting these outer lip discs as there are perforations for the holes around the idler face and you must ensure these are lined up correctly as there are no locating pins. With the lip discs fitted there are noticeable join lines around the outer edge and these have to be filled, you only need to fill the joins on about 40% of the rims as the tracks cover the remainder so this isn’t a really big filling job but take care not to fill the small holes that should be there in the process. The idlers fit snugly to the axle stubs to complete the assembly. 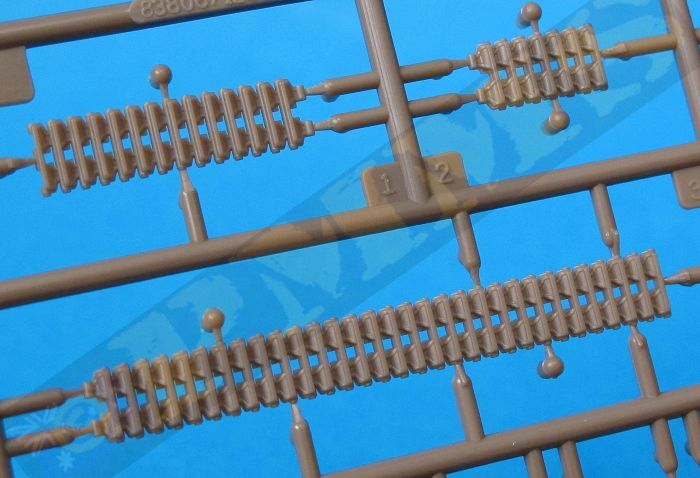 These are link and length with nicely done link details and consist of six longer and 27 individual links per track run with each individual link having 3 sprue attachment burs to be cleaned before assembly. Twelve individual links fit together to go around the drive sprocket and idler wheels and it’s best to assemble these in a flat section, allow the glue to ‘go off’ and then fit around the wheels so the links don’t come apart while fitting which they tend to do until the glue dries a little. 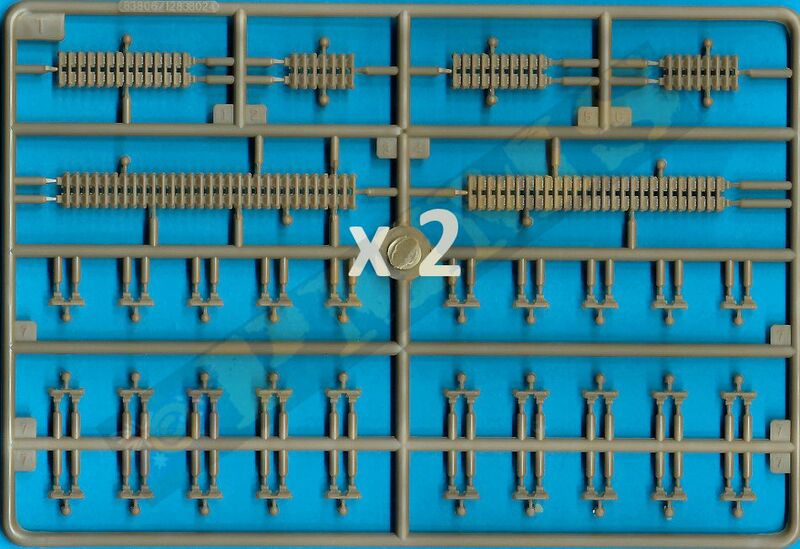 The fit of the longer track sections with the individual links around the suspension is very good and track ends mated perfectly without any problems but as mentioned above you need to leave the drive sprockets unglued to allow some movement to align the tracks correctly. Another possible issue is the top track run is straight without any sag but many wartime photos show quite a bit of sag between the return rollers on the top run but there are also some photos showing no sag as in the kit. It appears the tracks sag more after use than from when first fitted going from the photos and if you wanted the top track sag you will need to carefully heat the track sections and add the appropriate sag. Note, I didn’t fit the tracks until after fitting the hull top due to the glacis fit issues mentioned above, I also left the fenders off until last for the same reason. The fenders themselves have smaller details and storage boxes added and these can be fitted before fitting to the hull apart from the three small etched brackets (parts PE-11, PE-27, PE-28) which are best left till after the fenders are attached as there are no locating marks for these on the fender or hull sides. Another small issue with the large etched box (part PE-7) is you must bend this ‘away’ from the engraved bending lines and not ‘into’ the bending lines which is the customary manner. 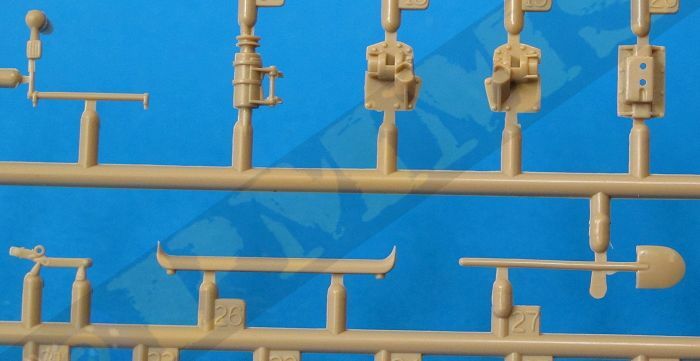 The upper hull is one large moulding that includes the glacis and has some nice surface details such as flush screws, rivets and raised details on the engine deck, the only parts added to the main hull are the two side lifting lugs but these will need their locating pins trimmed to fit into the fairly shallow locating holes on the hull side. On the inside are the driver’s instrument panel and hatch opening arm with alternate arms for the hatch open or closed. 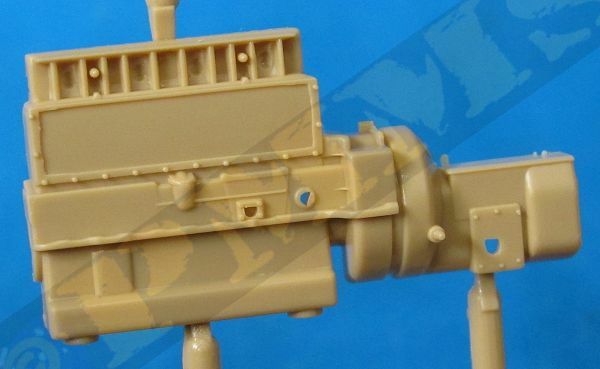 Most of the action is with the glacis with the transmission cover fitting neatly into place , there are a couple of very small etched parts added to the cover and part PE-5 needs careful bending as there are no bend lines included but this shouldn’t be too much trouble? 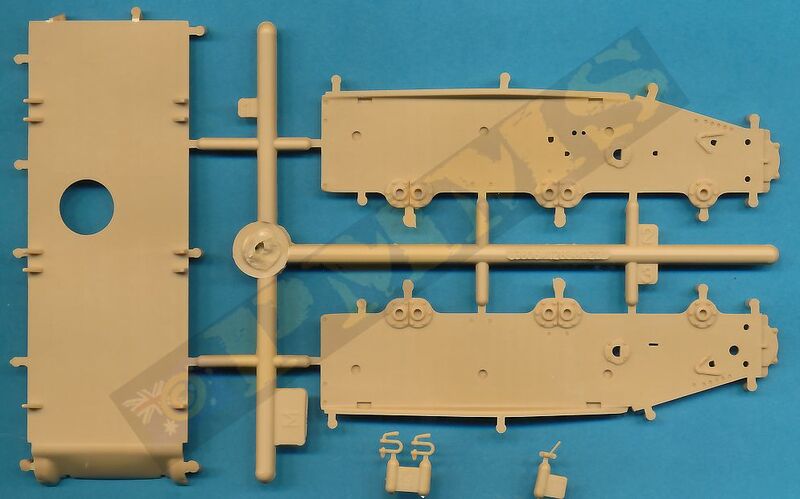 The two part driver’s hatch has small details added inside and out for the forward hatch with the upper hatch having five small parts added for the inner hinge and supports, these are quite tricky to fit as the instructions aren’t that clear especially with fitting the grab handle (part B39) and you should make sure these are all sitting correctly. 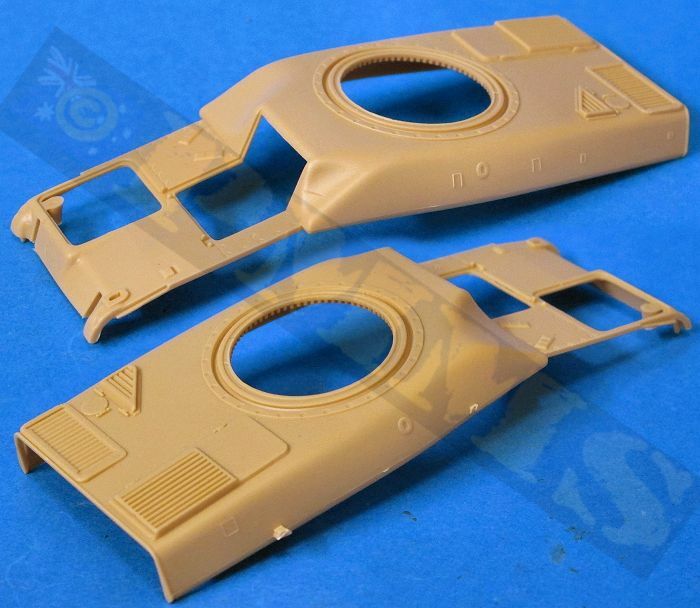 There is also a small separate visor for the upper door and this can be fitted open or closed as can be the two larger hatches if you wish to show off some of the interior? Other items fitted are the horn and two part light as well as the small cable brackets and the forward tow shackle lugs, these need care as they don’t have any actual locating pins and just ‘sit’ on the cut-out in the glacis so you need make sure these are lined up correctly as the glue dries, There is also an etched “Renault” badge on the front of the glacis. 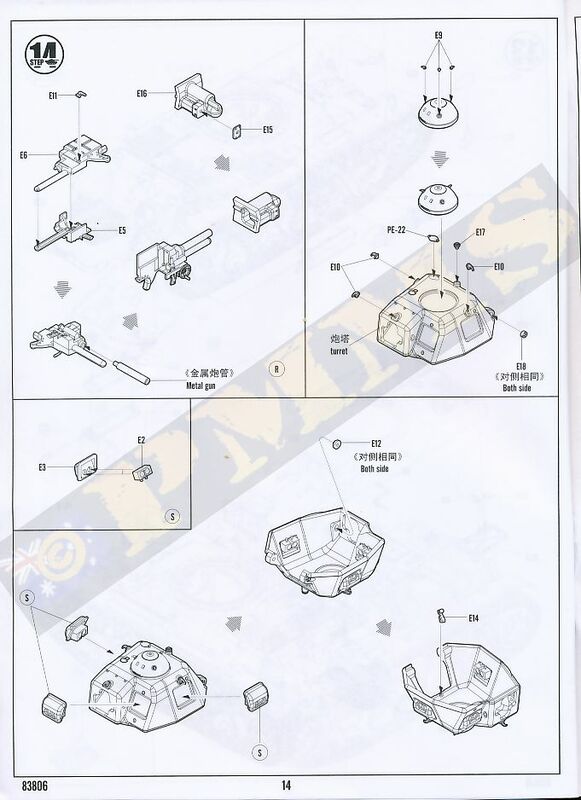 It could also be an idea not to fit any of these parts until after the upper and lower hull are fitted together to avoid damage as there is a bit of work needed to get the glacis to fit to the lower hull. 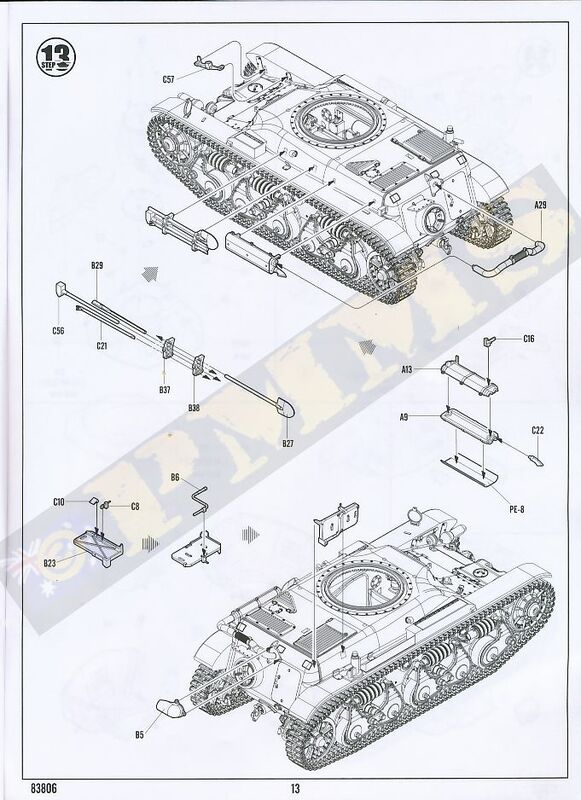 As mentioned the forward part of the glacis has to fit inside the projections inside the hull side panels and unfortunately this simply will not happen with the design of the parts, the locating pins at the front of the glacis also hinder the process but you should NOT cut off these pins as they are needed to align the front join correctly, or as correctly as it can be. The method I used to fit the hull/glacis was to trim off the small lip from the front edge of the glacis, this allowed the glacis to slip into place, you will need to slightly flex out the hull sides but this shouldn’t be a problem? 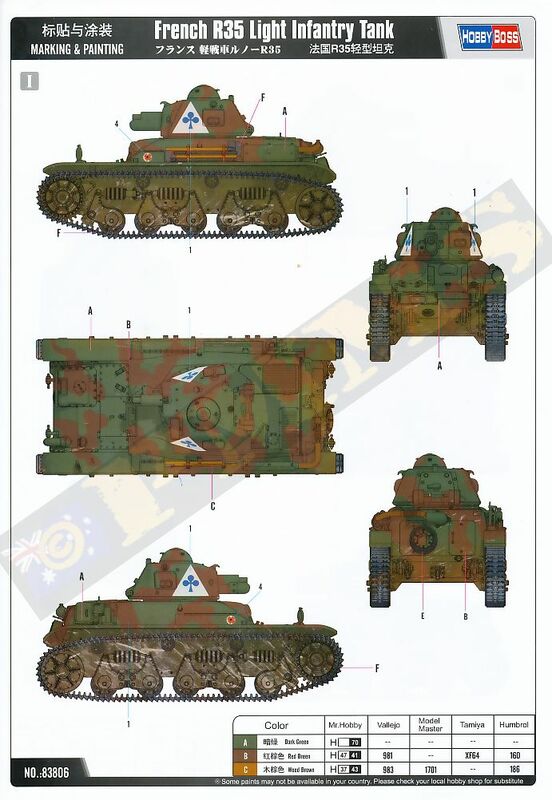 The other issue is the glacis is slightly too narrow and when fitted there will be gaps along both sides between the glacis and hull sides. The fit of the rear hull section to the hull sides is very good but if you press the forward hull sides inward to mate to the glacis will result with the underside rear hull fit leaving a gap and also the hull side will not be vertical so filling the gap with thin card is the best option. Image showing the small lip trimmed from the glacis to allow for fitting. 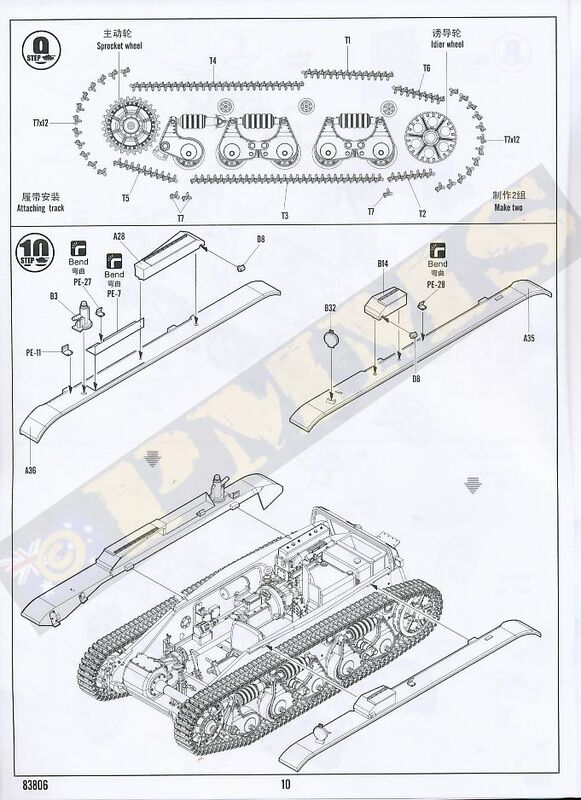 With the upper and lower hull parts fitted together, the fit to the rear hull section was also very good and the fenders and tracks can be added as mentioned above along with the various tools as per the instructions. The two part muffler has a separate small outlet and a large etched heat guard, this needs the be bent to the contours of the muffler but there is no indication given on the part or in the instructions for this and you will need to use the muffler itself as a guide to bending. With the muffler added the one piece exhaust pipe is added along with the armoured cover over the rear hull pipe attachment and I needed to trim the exhaust pipe pin to get this to fit properly into the muffler but other than that the assembly fitted nicely. 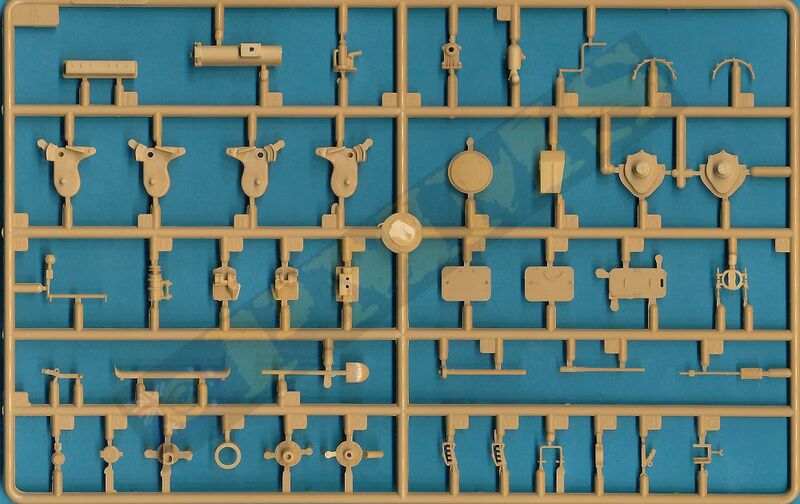 The turret shell is a single moulding with the vision ports, top cupola, rear door and lower ring as separate parts along the small lifting hooks and inside gun breech and a metal barrel tube for a fairly simple assembly overall. There are quite a few mould lines that need to be removed from around the turret edges and those at the front were quite deep on my part so care is needed not to alter the shape of the corners in the process, see the image showing the lines to be removed. 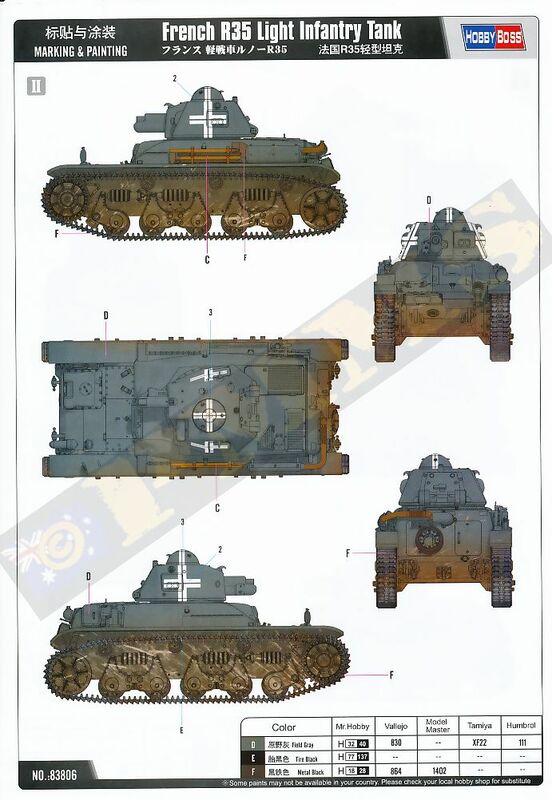 Dimensionally there were a few discrepancies around the lower edge outline as shown in the image below when compared to the Tank Power book plans but given the known plan errors I am not going to get overly excited about these as the turret doesn’t look distorted to the eye, but this again is up the individual to make a judgement on? 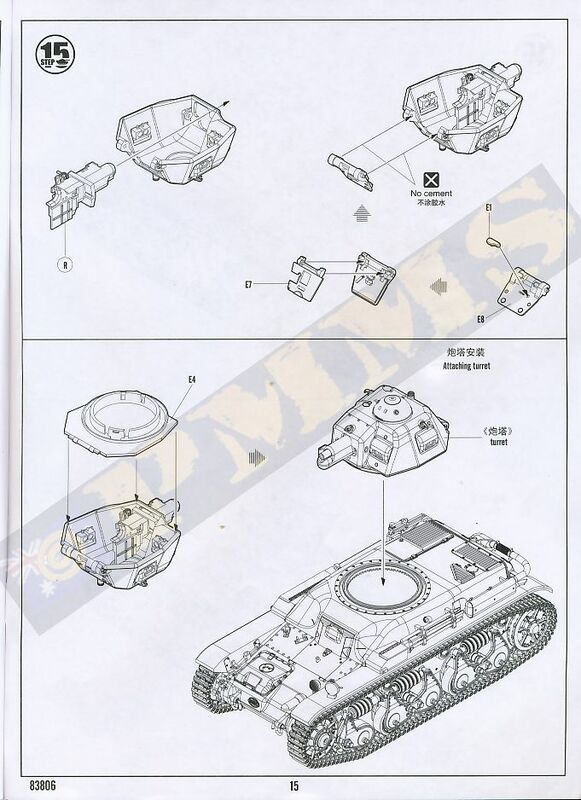 The plan outline in black compared the kit lower turret outline in red. Assembly of the gun breech is straightforward and this clips into two small brackets added inside the turret front to allow for elevation. 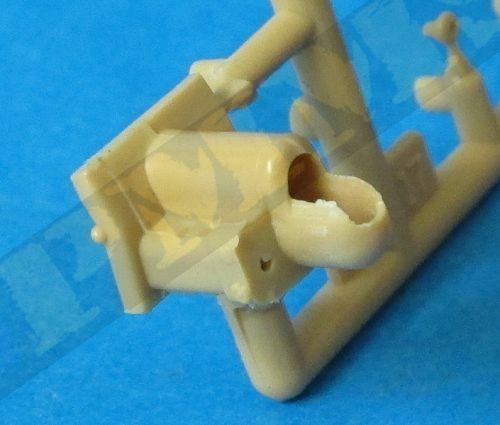 The metal barrel tube fits into the outer gun cradle/recuperator but there is some excess plastic/flash to be carefully removed from the outer edge of the cradle, this is due to the forward edge being moulded very thin which does give a good appearance but you need to make sure you don’t remove any of the actual cradle during clean-up. The rear door is designed with a movable hinge but you will need to shorten the hinge pins as these force the rear turret walls outwards if fitted as they come, fit the two outer hinge plugs (parts E18) before fitting the hatch to ensure these are positioned correctly, if you fit the plugs after the hatch without trimming the hatch hinge pins the plugs will sit too far out. 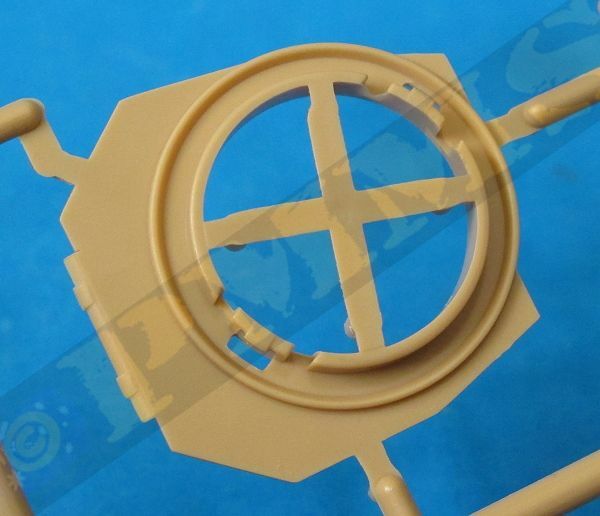 The hatch also has an inner detail panel should you wish to show the hatch open. The three early style periscopes assembly and fit neatly to the turret opening but there is some minor movement possible so ensure these are positioned centrally in the openings. 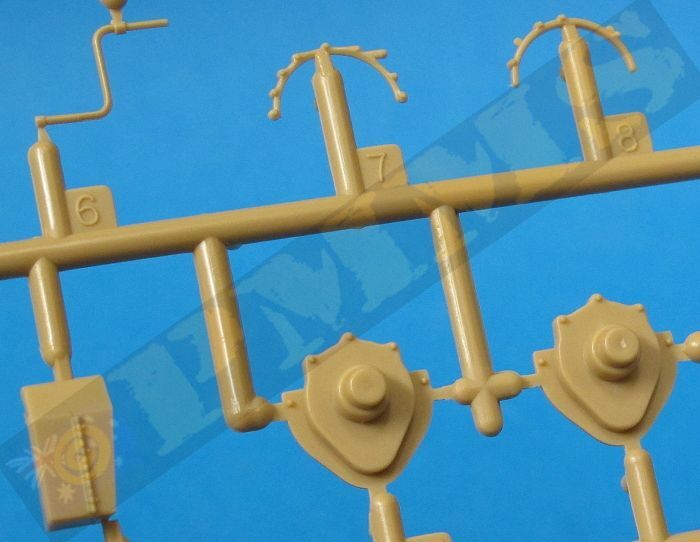 There are three very small lifting hooks for the turret and three even smaller lifting hooks for the cupola that need care in handling due to the shape and I found it easier to glue these in place and then clean up the sprue bur after the glue had dried. Fitting the lower turret ring is easy but you may need to trim the rear edges slightly as it may force the sides of turret out and test fitting will determine if trimming is needed? 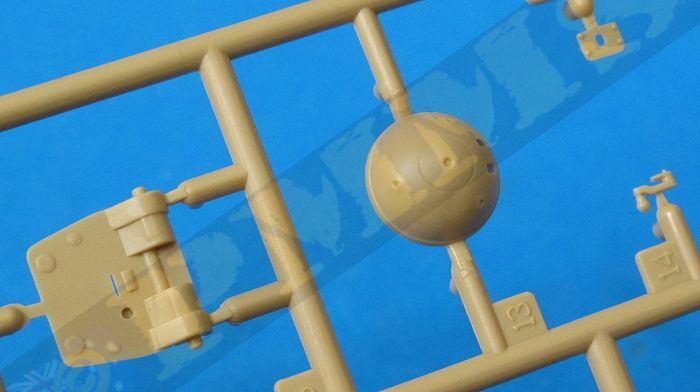 The assembled turret just clips into the hull turret ring and holds in place nicely while allowing traverse, make sure you clip this down properly sitting flush with the hull and not have it sitting up like depicted on the box art image. 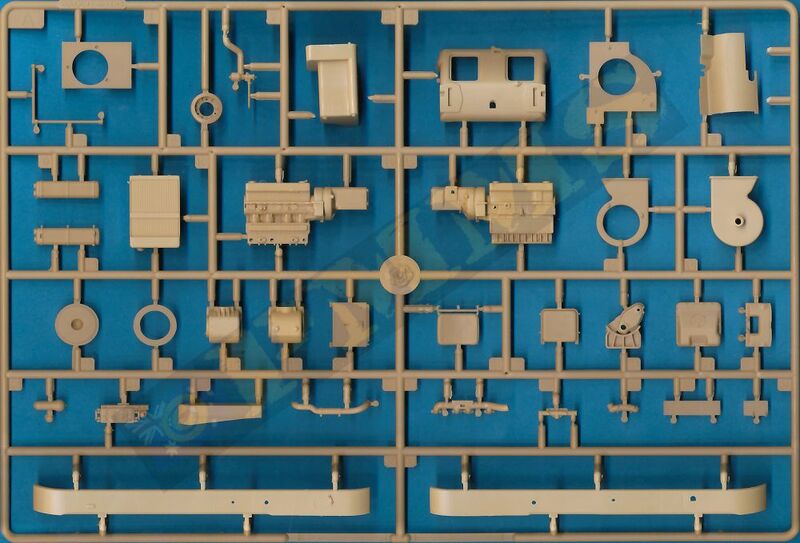 The small decal sheet is nicely printed buy the two options provided are fairly mundane considering the many different cam schemes and markings applied to the R35 during its service life and no doubt this will give scope to the aftermarket decal producers to offer more options. 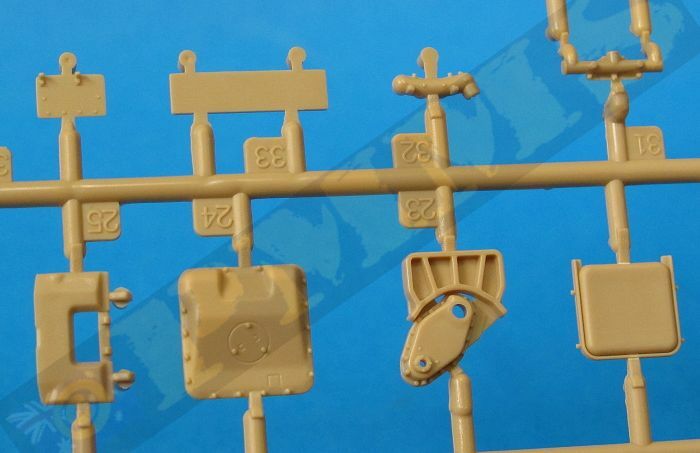 Overall you can end up with a nice model of the early Renault R35 as the level of detail on the parts is quite good with nice surface details on the hull etc. 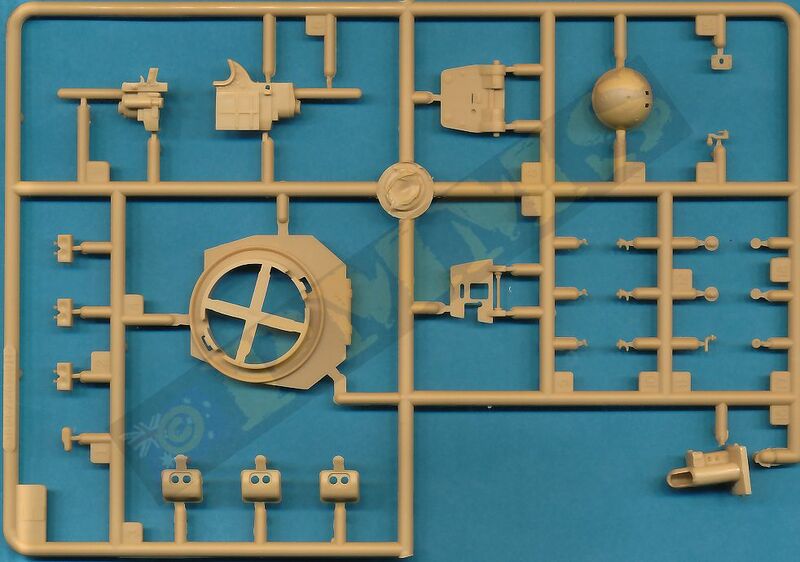 but the amount of work required along the way seems a little disproportionate to the size of the finished kit. 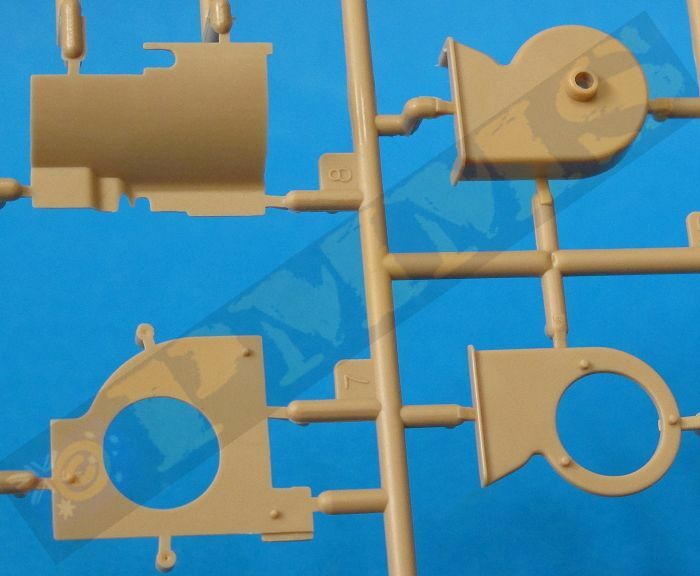 This is especially so for the suspension with the inclusion of etched parts that do nothing for the level of detail but add considerably to the assembly required, there are the return rollers that need repositioning to fit the track and numerous other smaller fit issues to deal with. 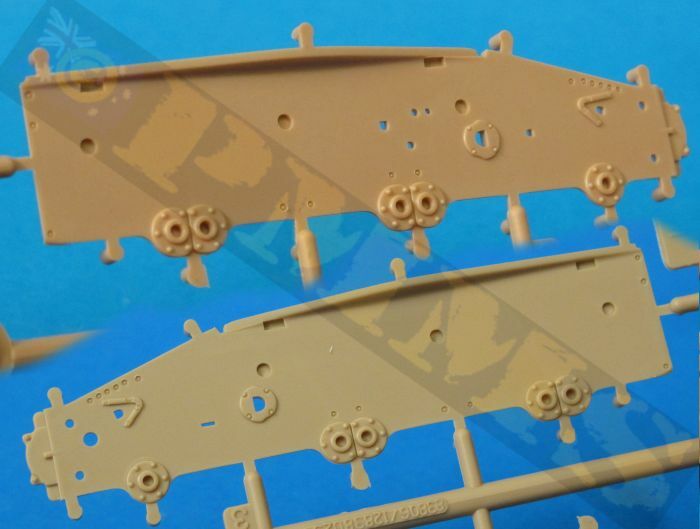 The fit of the assembled bogies to the hull is sloppy at best and the drive sprockets need care in fitting but thankfully the fit of the length and length track was good relieving you of an additional headache. 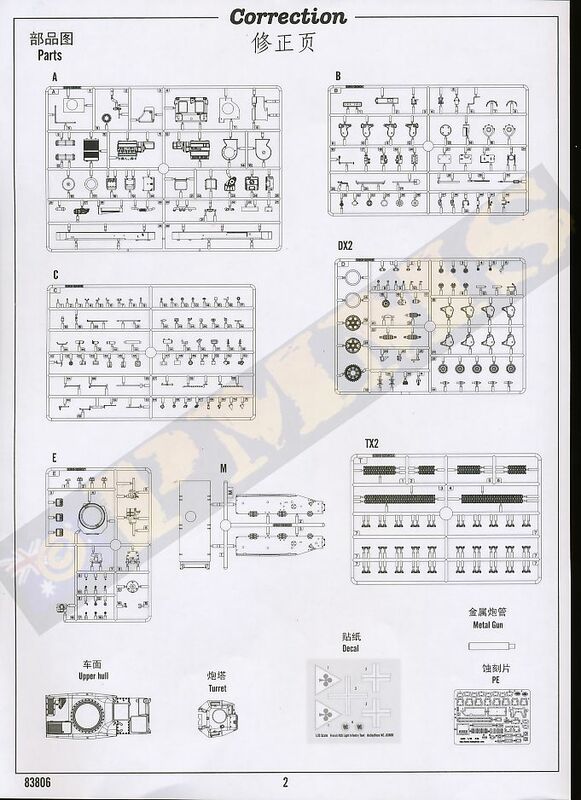 You do have a fairly complete interior (minus the ammo racks) but very little of this can be seen after assembly especially the engine/radiator assemblies and along with the work needed to fit the glacis to the lower hull as it’s simply not possible to assembly this the way the instructions indicate. 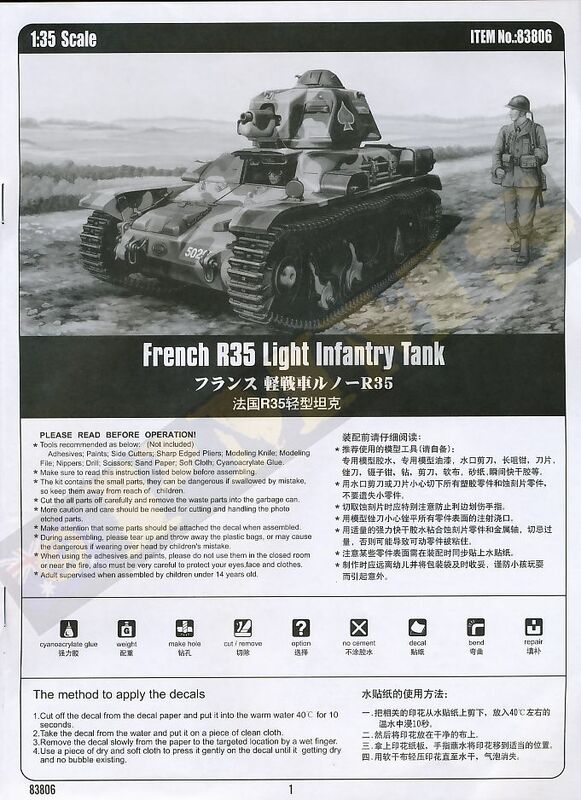 But if you are prepared to put in the effort a nice model can result and those wanting to add early French armour to their collections will probably be pleased with this kit release. 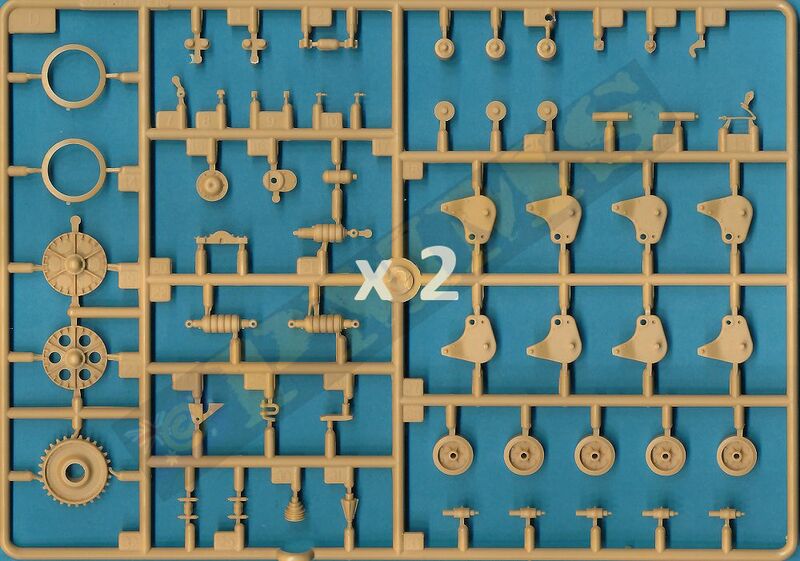 Overall I found this a very frustrating build in a number of areas especially given the small size of the final kit and perseverance will be a virtue and I apologise for the time taken to post this review as a consequence.